At top left, a VLA image of the M87 galaxy shows the radio-emitting jets at a scale of about 200,000 light-years. Subsequent zooms progress closer into the galaxy's core, where the supermassive black hole resides. In the artist's conception (background), the black hole illustrated at the center is about twice the size of our Solar System, a tiny fraction of the size of the galaxy, but holding some six billion times the mass of the Sun. Photons with a trillion times more energy than visiblelight are flying out of a relatively nearby galaxy. Until now, scientists didn't understand this light's origin,but a new study shows that its source is a giant blackhole inside the M87 galaxy. The radiation takes the form of high-frequencygamma rays. "We detect it in roughly 25 galaxies so far but wenever knew where exactly it was coming from," said study team memberMatthias Beilicke, an astrophysicist at Washington University in St. Louis. "Onlyin the case of M87 were we able to narrow it down to the black hole vicinity." Matter funnels into the supermassive black hole from a ringof material circling around it and called an accretion disk. Some matter isalso propelled out in verybright jets that stream across space. One hypothesis suggests the gamma-ray flares occur when anextra amount of matter is pulled out of the accretion disk and injected intothe jets. Either electrons or protons in the jet could interact with light photonsor matter to create the extremely high-energy gamma rays. "This acceleration mechanism requires strongmagnetic fields which can be found around the black hole," Beilickesaid. "We need charged particles accelerated to very high energies in order to emit gamma rays at these energies." The observations could help scientists understand theenvironment around gigantic black holes like this one, which contains the massof more than six billion suns. "The fact that there are particles accelerated up tosuch high speeds gives us input for the modeling of these systems,"Beilicke told SPACE.com. "M87 is so far more or less the only source whichreally allows this particular kind of study." The researchers were able to pin down the radiation's originationpoint by combining measurements of the gamma-rays with radio-wave observations.Even though gamma rays cannot usually pierce through Earth's atmosphere,ground-based telescopes can detect them by looking for telltale flashes offaint blue light that result when gamma rays hit the air. These observationsalso reflect the direction the gamma rays came from, though they are not veryprecise. Astronomers also observed M87 with the National ScienceFoundation?s Very Long Baseline Array (VLBA), a group of radio telescopesspread out around the United States. These observations revealed a burst ofradio light that coincided with the gamma-ray flares, which usually lasted afew days. The radio flares, imaged with much more precision than gamma-raylight, could be traced back to the location of the supermassive black hole inthe center of M87. 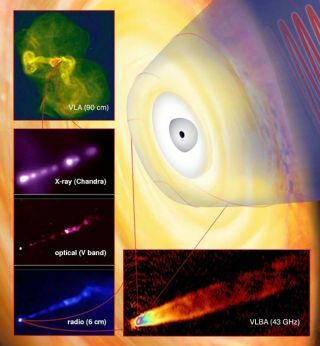 "Combining the gamma-ray observations with thesupersharp radio 'vision' of the VLBA allowed us to see that the gamma rays arecoming from a region very near the black hole itself," said team memberCraig Walker of the National Radio Astronomy Observatory (NRAO). M87, at 50 million light-years from Earth, is much closerthan any similar gamma-ray flare sources, so it could be scientists best bet tostudy these systems for a while. The new study is detailed in the July 2 issue of the journalScience.